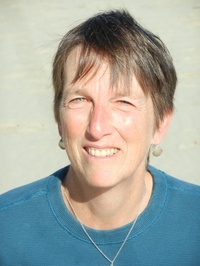 Karen McPherson is a poet, literary translator, editor in the Airlie Press collective, and Professor of French and francophone literature at the University of Oregon. She is the author of the poetry chapbook Sketching Elise (2012) and of the full-length poetry collection Skein of Light (2014). In fall 2013, Guernica Editions in Toronto published her translation into English of the first two volumes of Quebec poet and essayist Louise Warren’s Archives trilogy: Delft Blue & Objects of the World. She lives in Eugene, Oregon, with her life partner, Elise. Her website is www.kmcphersonpoet.com. Her poems and translations have also appeared in numerous journals and anthologies including Calyx, Poetry Motel, Fireweed, Descant, Umbrella, Centri Karen McPherson is a poet, literary translator, editor in the Airlie Press collective, and Professor of French and francophone literature at the University of Oregon. She is the author of the poetry chapbook Sketching Elise (2012) and of the full-length poetry collection Skein of Light (2014). In fall 2013, Guernica Editions in Toronto published her translation into English of the first two volumes of Quebec poet and essayist Louise Warren’s Archives trilogy: Delft Blue & Objects of the World. She lives in Eugene, Oregon, with her life partner, Elise. Her website is www.kmcphersonpoet.com. Her poems and translations have also appeared in numerous journals and anthologies including Calyx, Poetry Motel, Fireweed, Descant, Umbrella, Centrifugal Eye, Cider Press Review, Passager, Paper Nautilus, Potomac Review, Zoland Poetry,Saranac Review, Beloit Poetry Journal, the Lane Literary Guild anthology Dona Nobis Pacem, and the anthology Bigger Than They Appear. We’d love your help. Let us know what’s wrong with this preview of Irma Voth by Miriam Toews. We’d love your help. Let us know what’s wrong with this preview of The Flying Troutmans by Miriam Toews. We’d love your help. Let us know what’s wrong with this preview of Ahab's Wife, or The Star-Gazer by Sena Jeter Naslund. I loved it so much I bought a copy. Will definitely reread. We’d love your help. Let us know what’s wrong with this preview of The Art of the Wasted Day by Patricia Hampl.